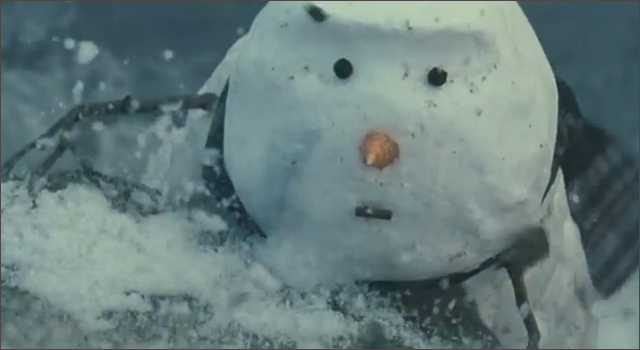 UK department store chain John Lewis is out of the gate early with their 2012 Christmas ad. The ad follows the quest of a snowman who one morning mysteriously disappears, leaving the snow-woman behind as he heads off on an epic (but very slow) journey over mountains, through flocks of sheep, across streams, over highways and past raucous gangs of snowball-throwing . The special purpose behind the quest is finally revealed upon his return on Christmas morning. This year’s ad features a remake of Frankie Goes to Hollywood’s classic ‘The Power of Love’ by English singer-songwriter, Gabrielle Aplin. John Lewis ads from past Christmas’ since 2008 have featured versions of other classic songs, including Slow Moving Millie’s (Amelia Warner) rendition of The Smiths “Please, Please, Please, Let Me Get What I Want” in 2011, Ellie Goulding version of Elton John’s “Your Song” in 2009 (which went on to reach #2 on the UK singles chart), 2009 saw Taken By Trees record Guns n’ Roses’ “Sweet Child O’Mine“, and in 2008 Matt Spinner performed the Beatles’ “From Me to You“. ‘The Journey’ was created by adamandeveddb. Mark your calendars fellow Canadians; February 9th is National Sweater Day. 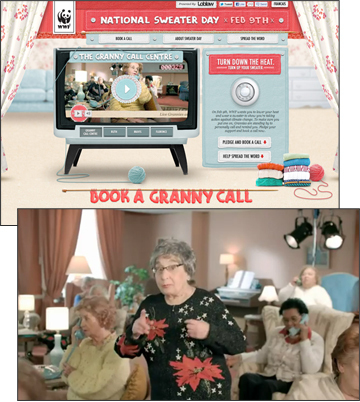 The WWF (supported by Loblaw) wants you to lower your heat a few degrees to help take action against climate change and they’ve created the Granny Call Centre, complete with a full roster 20 Grannies, Nanas, Oma, Gammies and Bubbies who will personally call you on February 9. Just choose one of the lovely ladies and book a time on February 6, 7 or 8 for your Sweater Day reminder call. I love the campaign creative. The Sweater Day website interface is adorable (and I don’t use that word often). The hand-sewn felt buttons, knitting yarn and lace doilies look awesome. If you’d like to promote National Sweater Day at your office, school or college you can download one of the promotional kits featured on the site. The National Sweater Day campaign was created by Toronto agency john st. Other recent work by the agency include the Catvertising video, Rethink Breast Cancer ‘Your Man Reminder’ mobile app and the Stanfield’s Guy in His Underwear campaign to raise money for Testicular Cancer research. It’s true that Calgary can be a pretty cold place in the winter, but like most places here in the Great White North, Calgarians have developed unique ways to stay warm when the snow begins to pile up and the temperatures start to drop. To help warm up the Calgary Philharmonic Orchestra Chorus for the 2011 winter season, Tourism Calgary asked its Twitter followers to tweet their answers to the question, “How do you stay warm in #YYC?”. The tweets using the hashtag #cpowarmup were brought together and the 20 best ones were set to the music of ‘O Fortuna’ by Chorus Master Timothy Shantz. The results were recorded on November 29 at the Jack Singer Concert Hall and feature such helpful keep warm tips as, “Bowls of noodles, Warm hot chocolate, Gravy Action on my cheese”, “Try hot yoga! or a nose hat! Or black silk long underwear” or my personal favorite “Clothes in dryer. Set the timer. Hop into a warm outfit”. The project was created by Vancouver social media agency Village & Co.. 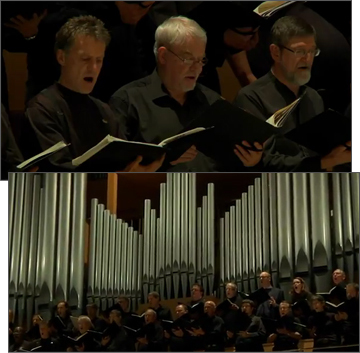 The video was shot and edited by Calgary’s Nur Films. Wim Hof is a Dutch adventurer and the last thing he needs to feel comfortable on a cold winter day is a pair of heated snow pants. Hoff has worn just shorts when climbed to the top of Mount Kilimanjaro in his shorts and ran in a marathon in Finland in temperatures that dropped close to −20 °C. 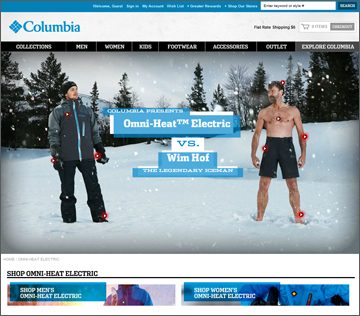 So why hire Hof to appear in a series of ads promoting Columbia’s new battery-heated winterwear? After all, the last thing you’ll find Hoff wearing on a cold winter day is a pair of snow pants, let alone heated ones. All it takes is watching Hof submerge himself into freezing water or sit in a container of ice to send a cold shiver up and down my spine, and makes me consider how toasty my buns would be in a pair of those battery heated pants. Not to mention the gloves, boots and jacket that come embedded with sweet, sweet adjustable heat at the touch of a button. While the Omni-Heat system uses rechargeable batteries to keep things warm and toasty, I’ll be more impressed when the jacket has solar panels on the shoulders. You can learn more about Wim Hof and win a set of Omni-Heat gear in a caption contest on the Columbia Sportswear Facebook page. 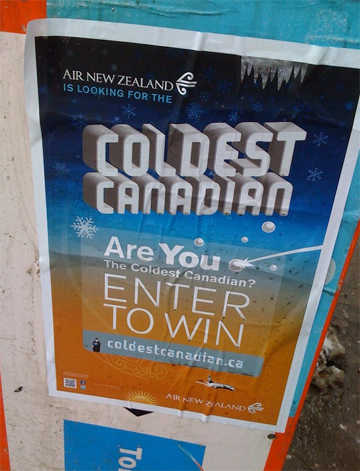 Today on the way in to work I saw 12×18 posters for Air New Zealand’s Coldest Canadian Contest on a few mail boxes and power poles along King Street West. It looked interesting enough, certainly topical enough in the -10 degree weather, and I’m a sucker for these user-generated video submission contests. I took a second look at them at lunch time and noticed a couple of issues with my first interaction with the creative. First of almost every poster I came across was mounted at waist or below height making it virtually impossible to get down and read the information including the URL. In the lower left corner was a very small QR code, I’d say it might have been a half-inch square. I squatted down in the slush and tried to scan it with my normally reliable QR code scanner, but it didn’t work for me. I assume it will redirect my mobile browser to the ColdestCanadian.ca site. I took a moment and typed the URL into my iPhone browser. The site that I saw was not optimized for mobile, it was the standard web page. It displayed fine, but I did have to enlarge and scan around in order to read. I did share the poster with a couple of friends, but the sharing was not done through the site. It was done by taking an iPhone photo and emailing it to them. I’ll be on the lookout in other media for additional initial touch points with the campaign. 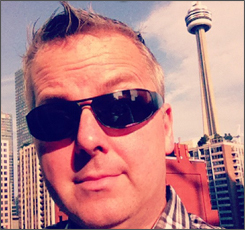 If you are using a QR code think about how your viewer is going to interact with it. Having it at the top of the poster would have been better position. Make sure the QR code is the correct ratio for scanners to pick it up. I am assuming the poster had been sized-down from a larger creative, so the ratio may have been correct to begin with. A site optimized for my mobile device would have allowed me to check out the information while I was still in the area. Once I arrived back at work, I did check out the site and the contest looks like a lot of fun. Air New Zealand is asking people who want to enter the contest to submit a three-minute video demonstrating why they are ‘The Coldest Canadian’. Once the video is approved its up to the entrant to collect as many votes, comments and likes as they can. The contest features weekly prizes as well as Grand Prize of a round-trip airfare to Auckland, NZ. There is a Google Map showing where the coldest Canadians are located and live reminders of how cold the temperatures are in different areas of the country (and how much warmer it is in New Zealand right now).